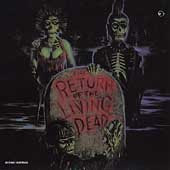 EDIT: The more I think about it, the more I realize The Return of The Living Dead soundtrack is superior to the compilation I had up earlier. Happy Halloween. The scene in Return where the mortician pulls himself into the flames to cremate himself to the Rocky Erikson song "Burn the Flames" (best tune on here btw).....is such an intense scene.....love that song!!!! Fantastic Post.